The African elephant is a flagship species and its conservation is of global significance. For more than a decade, conserving this iconic species has been a high priority for San Diego Zoo Global and the Institute for Conservation Research. Synergy between scientific studies conducted on our elephant herds at the San Diego Zoo and Safari Park and wild populations gives us a unique opportunity to increase our understanding of the species, while developing conservation solutions that can be applied on the ground in Africa. The African elephant herd at the San Diego Zoo Safari Park was rescued from a planned cull in Swaziland in 2003. Since then, we have implemented optimal husbandry and management practices to ensure the highest level of care to each member of the herd. Our exclusive use of positive reinforcement training has encouraged the natural behavior of these elephants. Additionally, because the habitat at the Safari Park was designed to mirror the environment the herd experienced in Swaziland, our Population Sustainability team has had the opportunity to study elephant behavior, movement patterns, social interactions, and reproductive success in a way that is reflective of wild populations. Saving the Swaziland herd has given us an unprecedented opportunity to learn from a multi-generational family of elephants. 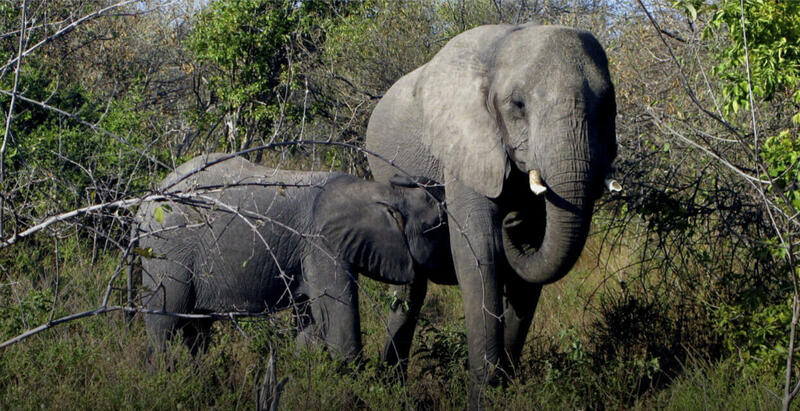 Alleviation of human-elephant conflict in townships and controlling human impacts in protected areas are of paramount importance for the conservation of wild African elephants. Today, a central dilemma confronting conservation biologists studying elephant habitat use is determining which factors regulate animal movement patterns. Habitat use is typically influenced by multiple factors, including ecology, physiology, environment, and social structure. We have partnered with Elephants Without Borders to monitor elephant ranging patterns inside and outside of national parks, across international boundaries, and in habitats ranging from near desert to lush riverine environments. Aerial surveys, as well as tracking individuals via GPS collars and associated behavioral observations, are key to determining herd composition and social dynamics. Our results are being used to help develop well-informed conservation action plans for the long-term survival of elephants in Africa. Since its establishment in 2015, Reteti Elephant Sanctuary has grown in all directions. Reteti is now home to 14 calves and 52 permanent staff with construction of a new workshop, staff accommodation, store and laboratory all underway.